It’s been a while, I know, but I haven’t much felt like writing lately, and I haven’t baked anything particularly spectacular. But it’s a three-day weekend, and I got a 40-mile ride today, so I’ve got plenty of time to write up this recipe, which I did last weekend. The recipe is from Baking with Less Sugar by Joanne Chang (Chronicle Books, 2015; p. 56), and it’s a variant of the “New Old-Fashioned Coffee Cake” from her first cookbook, Flour (which I profiled a year ago). To make the “Less Sugar” version, Chang substitutes honey for the sugar normally used to make streusel, reduces the sugar in the main cake batter, and also adds more crème fraîche. Instead of three eggs and one yolk, this version has two eggs and three yolks. But I’m getting ahead of myself! 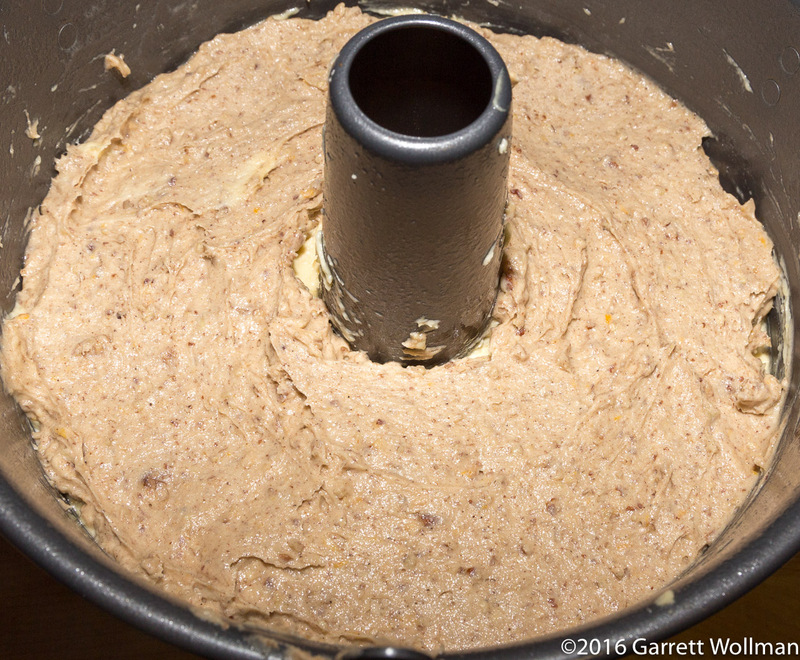 We start with a pecan streusel, just as with the original recipe. 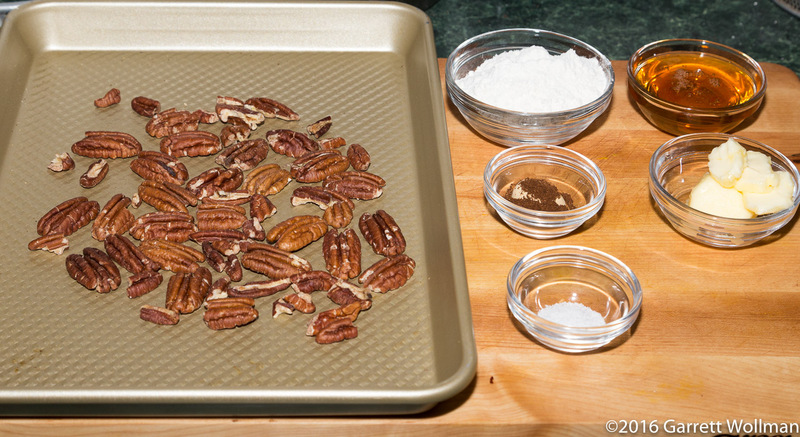 In addition to the 75 g of pecans, the recipe uses 65 g of honey, 1 tsp of cinnamon, ½ tsp of ginger, ¼ tsp of ground clove, ½ tsp of kosher salt, 45 g of cake flour, and 30 g of unsalted butter. 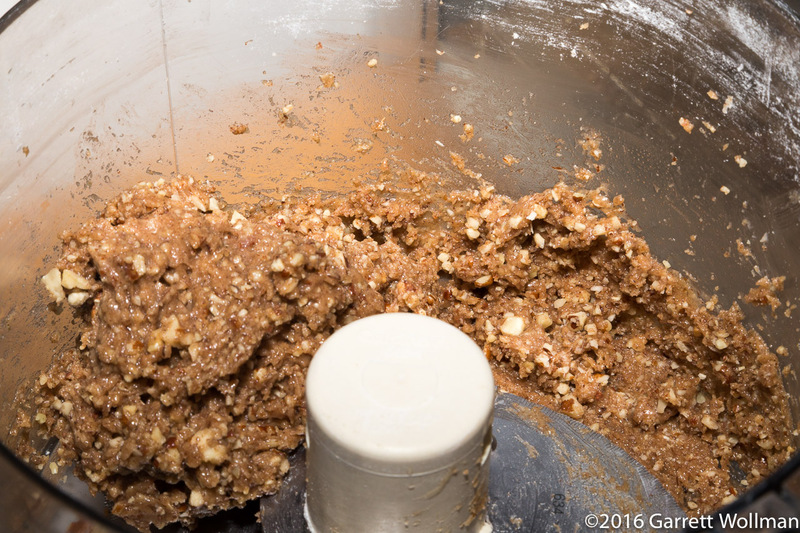 The streusel ingredients are whizzed together in the food processor, making a sticky mess. 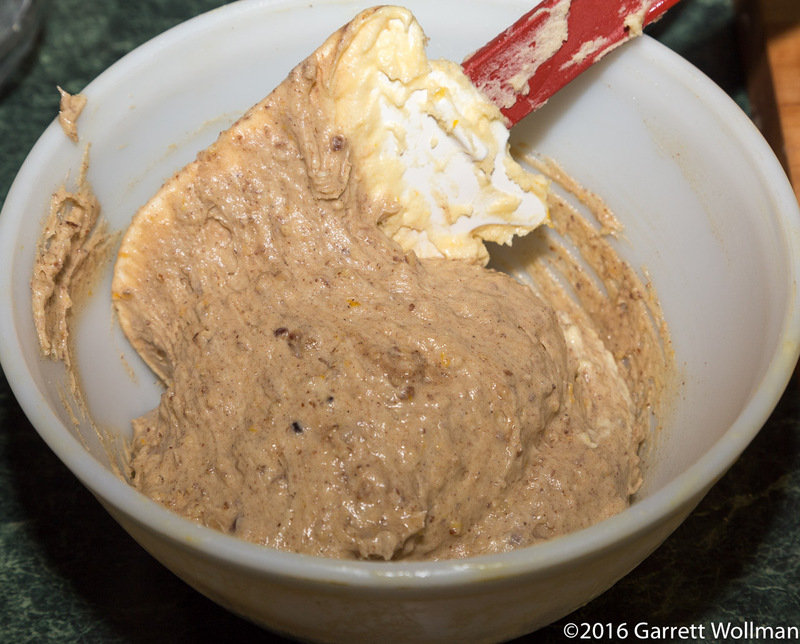 In addition to the other changes I noted, this version of the cake batter has triple the vanilla (2 tbl rather than 2 tsp) of the original, and adds a tablespoon of freshly grated orange peel (one large navel orange’s worth), which definitely comes through in the finished product. 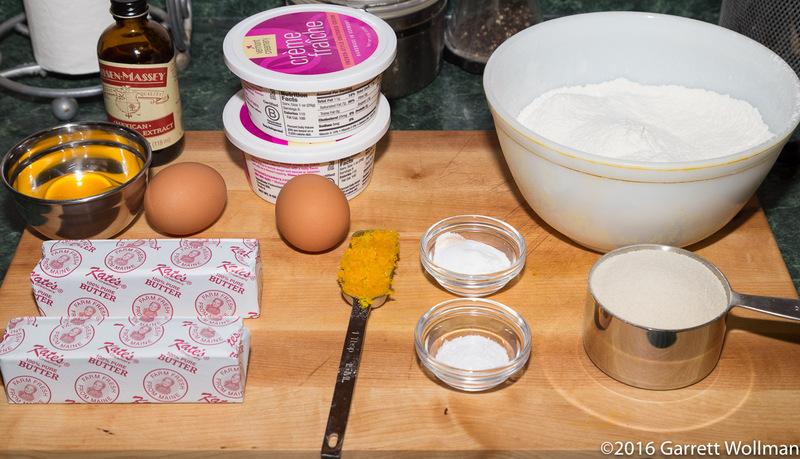 The other wet ingredients are 240 g crème fraîche, 225 g unsalted butter, 2 large eggs, and 3 egg yolks. The dry team consists of 300 g cake flour, 2 tsp baking powder, ½ tsp baking soda, 1 tsp kosher salt, and 140 g granulated sugar. 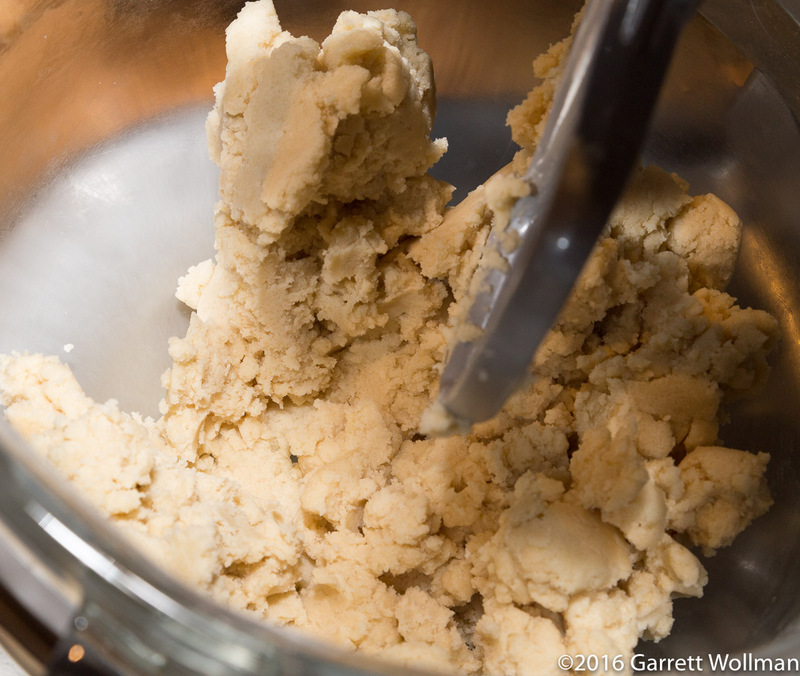 The cake batter is made by the “reverse creaming” method, wherein the dry ingredients are beaten with soft chunks of butter, which gives an exceedingly tender and delicate crumb, as the butterfat keeps the flour particles from getting wet and developing gluten during the mixing process. At this point, the batter looks more like a pie dough, and indeed you could make a pâte sucrée this way. 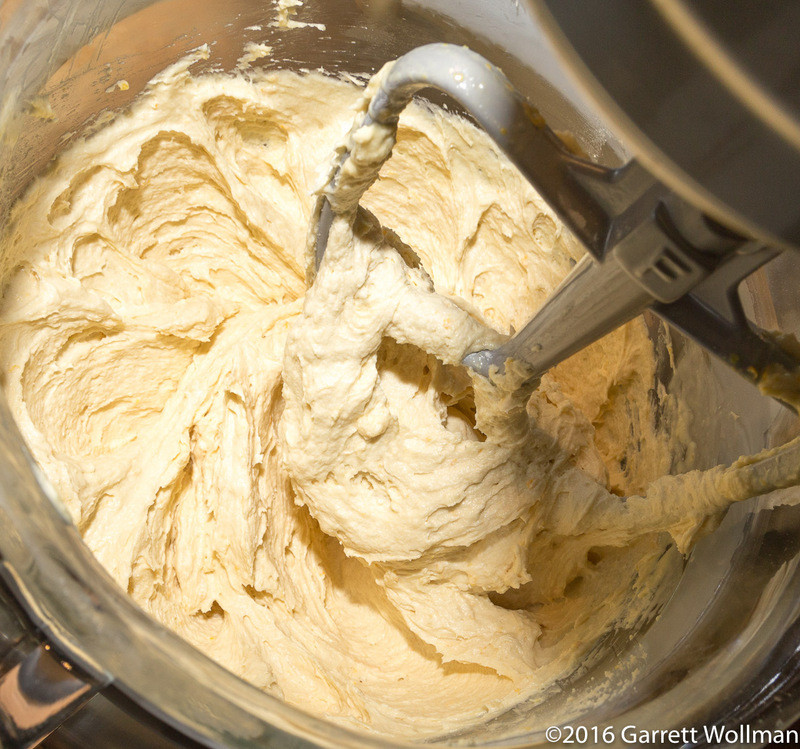 All of the remaining wet ingredients (everything but the butter) are simply whisked together before adding, in two lifts, to the flour-sugar-butter mixture. Just as in the original recipe, Chang has you take some cake batter (about a cup, in this recipe — the original uses more) and fold it into the streusel. The theory is that this is supposed to keep the (unleavened and thus denser) streusel from sinking through the cake during baking and landing on the bottom. 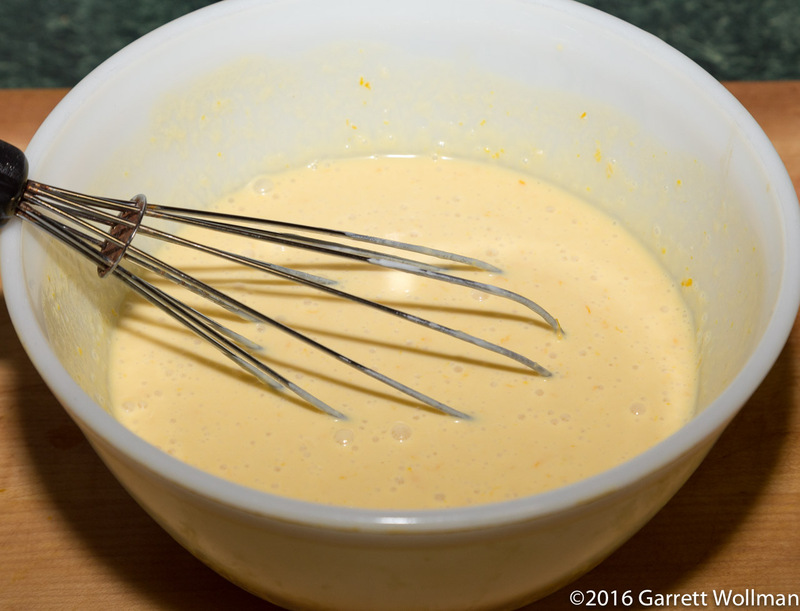 The remaining cake batter is spread evenly in a lubricated angel-food pan (Chang is specific about using a pan with a removable bottom, rather than the usual tube pan or a Bundt pan), and then the batter-streusel mixture is spread on top. The cake is baked in a 350°F (175°C) oven for 40–50 minutes — the longer time was definitely needed when I baked this cake. Unlike in the original recipe, I did not find that the streusel migrated into the rest of the cake; instead it remained as a thick, dark layer on the top of the cake. Sorry, no single-serving photos on this one. It was a very good cake, with an amazingly tender crumb, although a few people felt that the mixed streusel-cake topping bit was somewhat odd (and I for one would have preferred a more normal streusel topping, which I bet would turn out fabulous with this exact same recipe — just bake in a regular tube pan, with the streusel on the bottom, and invert only once to serve). As with most cakes I bake, I portioned this into 16 slices (quarter first, then quarter the quarters). Depending on your audience, you may find that it makes 20 to 24 smaller slices. 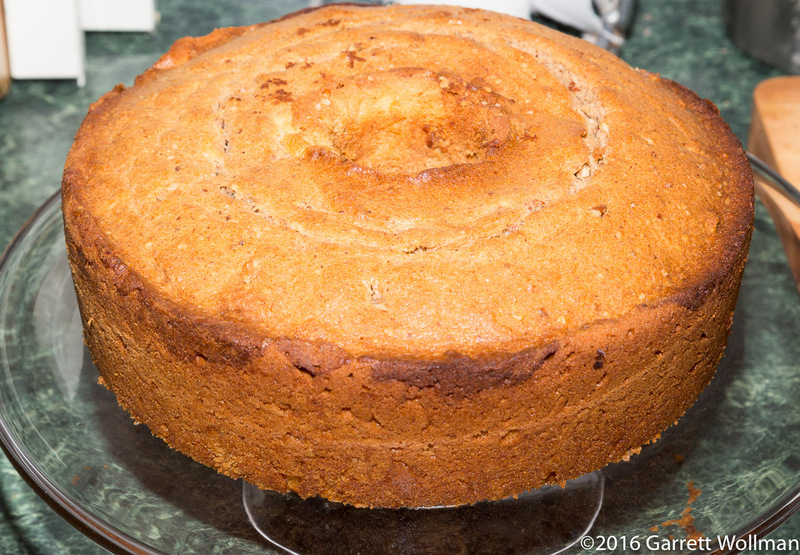 This entry was posted in Food and tagged coffee cake, Joanne Chang, pecans, recipe. Bookmark the permalink.